This is why a lot of travelers consider themselves “global citizens.” While they still love and appreciate their home country, they’ve grown to love other cultures and places and people as well. It’s likely that if you’ve traveled outside your home culture, you’ve experienced the news-stories-turned-human-stories phenomenon. When we form relationships with people around the globe, we can no longer detach ourselves from the news on our screens. We cannot separate statistics from humanity. If you’re anything like me, you may be feeling overwhelmed by those news stories right now, struggling to keep up, and wondering whether any one action you take will make a difference. Perhaps you’re from outside the U.S. and are considering boycotting travel to the U.S. because you disagree with the actions of our government. Or maybe you call the United States home, and you’re wondering what you can do. I admit to feeling discouraged at times and wanting to hide my head in the sand. But that’s not an option for so many people around the world who are struggling, so I’m doing my best to stay engaged. There are many ways to take action (check out the resources at the bottom of this post) and I’m not suggesting that travel will fix the world’s problems. But, I want to offer some practical ways to stay engaged and support the local community–and the immigrants and refugees who have settled there–while you’re traveling. 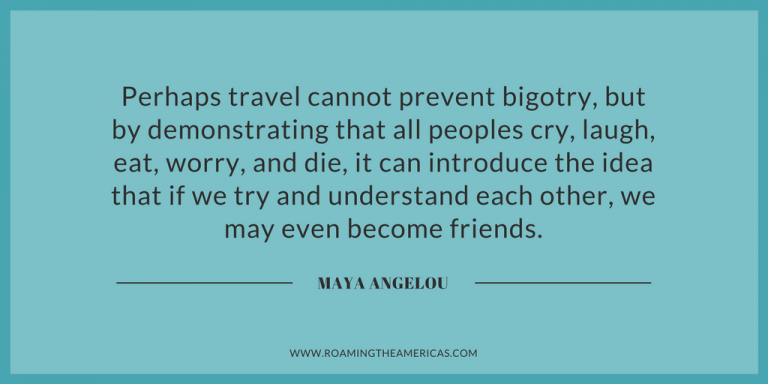 This list includes tours, restaurants, hotels, or other travel experiences that help you learn about, connect with, or support immigrants and refugees in the United States. This is a growing list, so feel free to let me know about other opportunities I can add. (I’d love to have all 50 states represented!) Last updated 10/25/2017. Visit the U.S. Immigration Station on Angel Island, which was the Ellis Island of the West Coast, located in San Francisco Bay. Refuge Coffee Co. is a mobile coffee shop in greater Atlanta that trains resettled refugees as baristas. Beyond offering living wage employment and job skills training, Refuge Coffee Co. desires to foster a vibrant community atmosphere–one that creates conversations, relationships, and a place for stories to be told. As founder Kitti Murray put it, “The coffee shop is an extension of the American living room.” She sees the coffee shop as a place to embrace new neighbors and create community. (Check out the video on their website to hear more about their story.) Refuge Coffee has 2 coffee trucks: one is parked outside a retro garage in Clarkston with space inside to work and gather with others, and the other is on the move in the Atlanta area. Find out where the roaming coffee truck will be on a given day by following them on Facebook, Twitter, and Instagram. They’re also working on building a coffee shop in Clarkston, Georgia, which will not only be a place of employment for more refugees but will be a space for their stories to be told. Lawrence, Mass has been nicknamed “The Immigrant City,” and the Lawrence History Center offers a way to explore this diverse immigrant history. Beyond simply preserving history, the center also seeks ways to bring this historical heritage to life for the community in engaging ways through various exhibits and educational opportunities. Attend a cooking class or workshop taught by refugees and immigrants at Local Abundance Kitchen in Cleveland. Their mission is to educate and assist refugees and immigrants with an empowering path to income. Additionally, they use local, seasonal ingredients in their classes that are sourced through local farmers, producers, and markets. Global Cleveland has also put together a list of immigrant- and refugee-owned businesses in Cleveland if you’re looking for restaurants or markets. The Exchange House in Akron offers a different kind of place to stay—a sort of cultural exchange hostel. They have converted a vacant house into a gathering space and cultural hub for the refugee community in Akron. There are also 3 rooms in the house that anyone can book on Airbnb. Visitors staying in the house are welcome to engage and get to know the community by joining them for tea, sitting in on an ESL class, or spending time on the first floor where cultural exchange programming occurs. The New Americans Tour of Philadelphia is a self-guided walking tour intended for those who have just become citizens or who are studying to take the citizenship test (though anyone can take the tour). While it doesn’t benefit immigrants or refugees directly, it’s an interesting way to explore Philadelphia’s historical sites and find out if you could pass the citizenship test. The Conflict Kitchen in Pittsburgh serves food from countries that the United States is in conflict with, such as Iran, Venezuela, and Cuba. Through the universal language of food, Conflict Kitchen tells stories and creates conversations that go beyond media headlines. Madpriest Coffee employs resettled refugees in Chattanooga, and their passion is to offer great coffee and help their employees succeed in whatever field they’re interested in pursuing (whether it’s to continue in the coffee business or move onto something else). I love what they’re all about: “Craft excellent coffee. Educate the curious. Champion the displaced.” Stop by their roastery and mini coffee shop to get a cup (or a bag to take home), or find it brewed elsewhere in Chattanooga at The Camp House. Get a family-style meal that’s made by an immigrant chef delivered to your home (or Airbnb or hotel room!) with Foodhini. Your purchase provides the chef with a livable wage and a chance to share a bit of their heritage with you. Currently, Foodhini offers Persian, Syrian, Filipino, Tibetan, and Laotian cuisine with plans to add more options in the future. Do you know of other travel experiences that connect with or support immigrants and refugees? Let me know in the comments! LEARN: Refugees in America (International Rescue Committee) is a great place to start with the basics. ADVOCATE: Call or send a letter to your elected members of Congress. GIVE: Make a donation to a reputable organization that provides relief in conflict zones (like Preemptive Love Coalition) or that resettles refugees in the United States (like International Rescue Committee or World Relief). VOLUNTEER: Help refugees in your community by volunteering with a local resettlement agency.